The muscle car is back!! 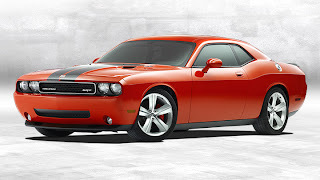 Chrysler has just announced the return of the muscle machine with the all new 2008 Dodge Challenger SRT8. ©2008 natalie1981.blogspot.com Fans of the original Dodge Challenger will not be disappointed as this new machine still sports the original Challenger design but with sleeker lines. 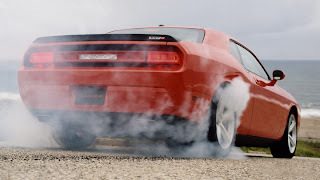 The new 2008 Dodge Challenger SRT8 will definitely capture the attention of younger generations who crave the look of older muscle machine but wants the latest technology on their cars. The 2008 Dodge Challenger SRT8 has a 6.1 liter HEMI V-8 engine that can produce 425 of horsepower and 420 lb.-ft. of torque. 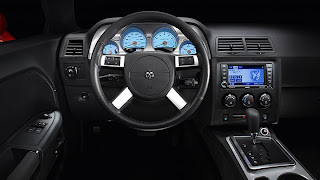 The 2008 Dodge Challenger SRT8 also features modern technology such GPS, "keyless go", MyGIG system, and UConnect hands-free communication to accommodate the inner geek of car enthusiasts. The 2008 Dodge Challenger SRT8 will be available in 3 colors: Bright Silver Metallic, HEMI Orange, and Brilliant Black Crystal Pearl Coat. Suggested retail price of the 2008 Dodge Challenger SRT8 is $37,995 and is expected to be available this Spring so save your money! Hi, your blog is very nice! congratulations! I invite you to visit my blog.